From planning to financing to politicking, MTC plays a crucial role in advancing major transportation projects around the Bay Area. Major regional projects often cross city or county boundaries. And many involve partnerships with multiple project sponsors. 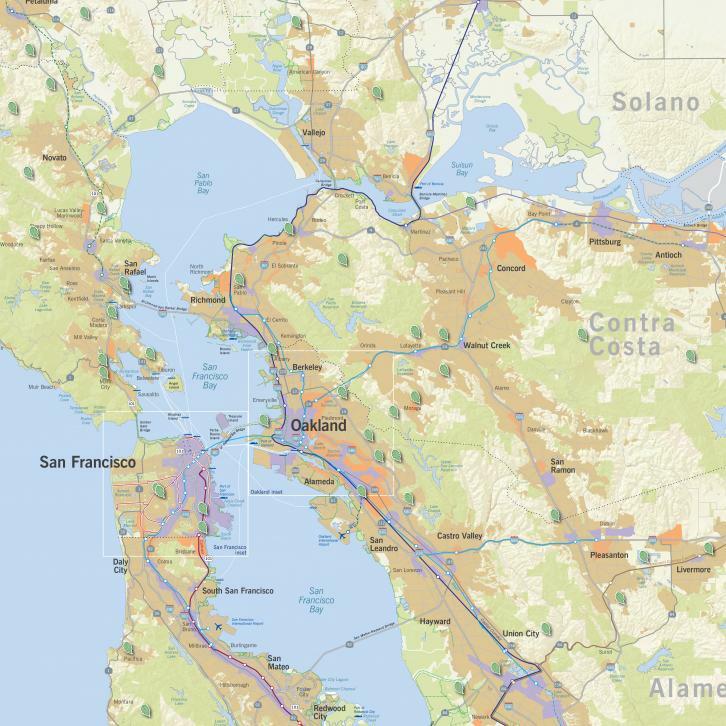 Map of transportation features and projects – Plan Bay Area 2013. MTC works closely with Caltrans, transit operators, county congestion management agencies and local governments to fine-tune project proposals. The goal for each project: to deliver the biggest possible bang for the buck. Did you know that our Regional Transit Expansion Program identifies the top priorities for new Bay Area transit projects? MTC helps our region compete with other metro areas for state and federal funding. Plan Bay Area directs about 88 percent of the transportation funds expected over the next 25 years to maintaining and operating the roads, highways and transit systems we already have. Only about 12 percent is dedicated to expanding highways, bridges and transit services.